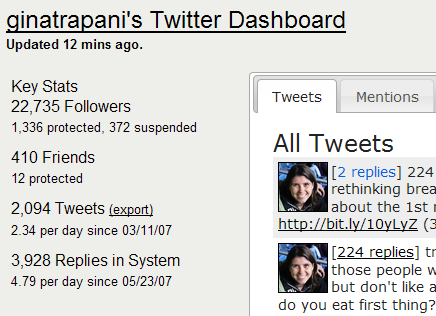 Since Gina Trapani stepped down from her role running Lifehacker, the blog she started under Gawker, she’s apparently been busy working on a new kind of Twitter application. Today, she gave a preview of what it will be on her new blog Smarterware. 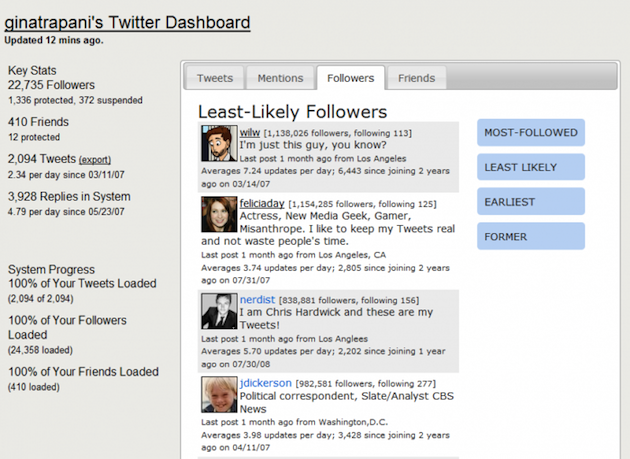 Tentatively called Twitalytic, it’s a self-hosted web-based application that grabs your tweets, archives them, and uses them to give you some interesting data about the people you follow and those who follow you. 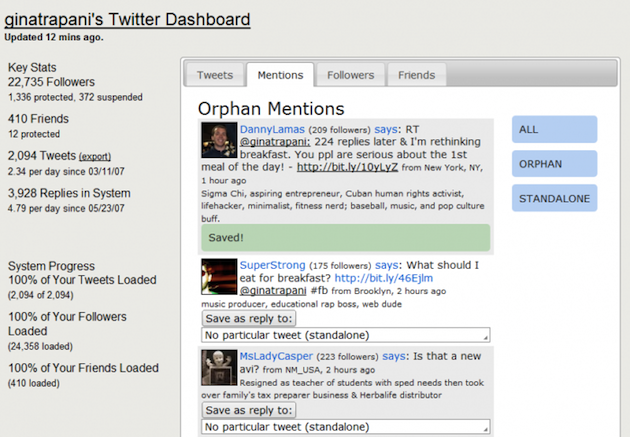 As you can see on the preview page Trapani has made public, one interesting thing that Twitalytic does is show you just how many people replied to individual tweets you’ve made. If you click on the link for these replies, you can see each of them on a new page. But that’s just one basic thing you can do with the service. That listing is the most basic thing Twitalytic can do. When you set it up and log into the app, you can curate replies and see other views of your data, like your “least likely” followers, your least and most active friends, your most replied-to tweets and more. For each of your friends or followers, you can see mutual friends, conversations you’ve had, and even what Twitter client that person uses most. If you’re approaching the 3,200 tweet mark, Twitalytic will also back up your tweets and let you export them into a simple text file. While she notes that other services do some of what her app does, Twitalytic is a bit different because you install it on your own server to use it. You can grab the pre-alpha code on Github. 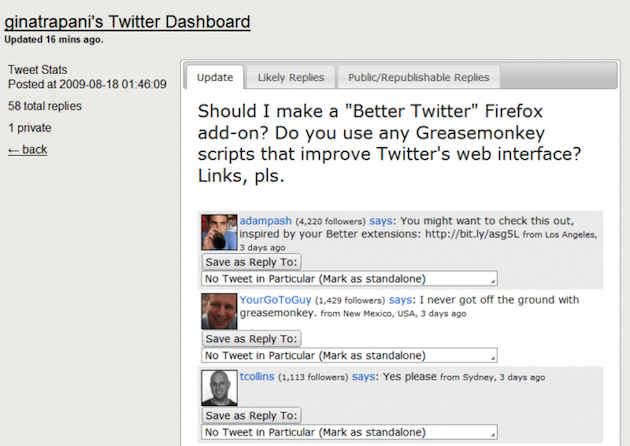 While not having a centralized app hosted elsewhere will limit Twitalytic’s appeal, plenty of folks will undoubtedly appreciate the ability to archive your own tweets and see more information about them.